Weddings, Concerts, Parties, Bar & Bat Mitzvahs since 1986! - Klezamir! Weddings, Concerts, Parties, Bar & Bat Mitzvahs since 1986! Roots Rockin’ Klezmer! Weddings, Bar or Bat Mitzvahs, celebrations of all kinds, concerts, school programs – KLEZAMIR does it all! 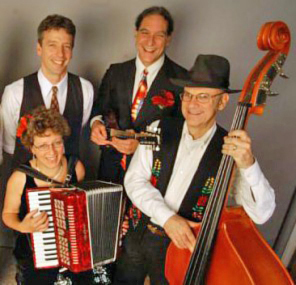 New England’s dynamic roots rockin’ klezmer band extraordinaire serves you up traditional Jewish favorites as well as a great selection of rock, pop, jazz, swing, classical, country and Bossa Nova for weddings, Bar and Bat Mitzvahs and celebrations of all kinds! Klezamir gives easy dance lessons on the spot, leads fun kid’s games and serves as MC and DJ, too! This great band infuses traditional klezmer with a wide range of other styles–rock, jazz, country, swing, rock, and bossa nova–in the tradition of true klezmorim from time immemorial.